The final flavour in director Edgar Wright’s Cornetto Trilogy, The World’s End has its merits but is far from a slice of fried gold, falling far behind the quality of its fellows Shaun of the Dead (2004) and Hot Fuzz (2007). Under duress from their erstwhile leader - the perpetual man-boy Gary King (Simon Pegg) - four friends (Nick Frost, Paddy Considine, Martin Freeman and Eddie Marsan) return to their home town in King’s attempt to recapture the greatest moment of his life: an aborted pub-crawl he and his friends attempted twenty years earlier. King’s pals seem disappointed that Gary is trapped in the past, while Gary can’t handle his friends having moved on. Worst of all, something sinister seems to be brewing in the pubs of their youth… and it isn’t the Guest Ale. 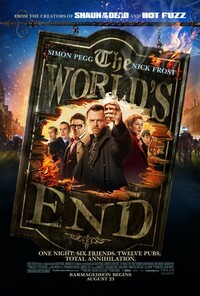 The World’s End is the team’s crack at a sci-fi comedy actioner, set against the backdrop of a home counties Garden City (ably played by locations in both Letchworth and Welwyn). The action is shot with the same flair Wright demonstrated in Scott Pilgrim vs the World (2010) and bodes well for his forthcoming Marvel superhero film Ant Man. One sequence in which King tries to avoid losing his pint amidst the fray is particularly pleasing and allows Pegg to display his physical comedy skills. It’s also initially interesting to see Frost and Pegg exchange their conventional roles for this film: the former plays the straight man in the double act for the first time in their partnership, but it’s still Pegg who seems to do the majority of the emotional heavy lifting. While the action succeeds in the entertainment and inventiveness stakes, the comedy and sci-fi elements sadly lag behind. The World’s End seems to lack the charm of both Shaun and Fuzz, and this may in part be the result of the film’s changed dynamic. Where Shaun and Fuzz are paeans to friendship, The World’s End is about a friendship gone sour - and this sour taste pervades the film like the smell of stale beer. The humour also seems slightly stale, not having nearly the same gag rate as Wright's previous servings. Freeman’s character is a good example of this, lumbered with the annoying and nonsensical character trait of overusing the acronym WTF. Freeman is (mostly) able to overcome this limitation, but its emblematic of how the “quirks” of the characters in The World’s End seem superfluous additions rather than charming ways of rounding out a character. Most frustrating of all is that despite the film's thematic richness, these themes never seem to be fully explored. The themes of nostalgia, identity, and conformity can be great fodder for both comedy and science fiction, but The World’s End never really seems to get its teeth into them. The film doesn’t have the same wry engagement with genre as Shaun and Fuzz, which seems an oversight given the tradition of British sci-fi (John Wyndham would have been a particularly useful touchstone). Indeed, the film seems to suffer most through comparison to the earlier flavours of the trilogy. The World’s End is not a bad film, it’s simply disappointingly mediocre. This review was published on August 05, 2013.